ND (1901 - 1902) 35mm aluminum, Rarity R9 (3 - 6 known). The Exposed Reef Mine was located up the Carr Canyon road overlooking Sierra Vista, AZ. Nothing exists today and the area is now a recreational area and campground. 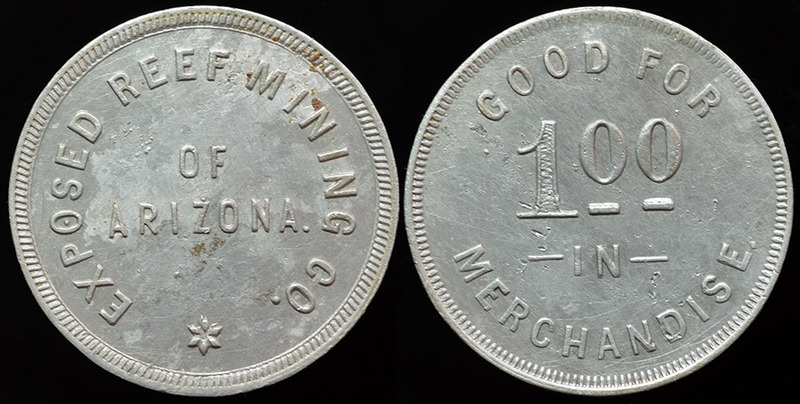 Beginning around 1900 the varied mining operations extracted gold and silver. Later, up to the 1950's, tungsten was extracted. As a side note...I have a nice 4 penny weight gold nugget found at this mine in the 1970's. I hope to show it here soon, I gave it to my mother on a chain in 1978, it's shaped like Florida and on the back side there's an embedded quartz crystal in the area of central FL, right where she lives!